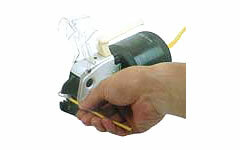 AC-5N Crimping Tools: Izumi Products. 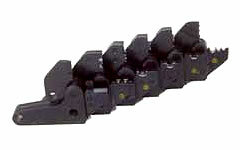 Capable of crimping several types of terminals up to 5.5mm2 with interchangable jaws. Bench mounted, air operated AC-5N is suitable for continuous crimping for production line. The AC-5ND comes with AF2 foot pedal. AF2 foot pedal adjusts jaw butting time by air timer so that butting tme is regulated regardless of operator. This will prevent spring back of crimped terminal and maintain consant crimp heights. Price does not include any jaws. Cutter Jaw, Cu, Al wire 7mm O.D.